Finally – any advice on how to get 1 more (female) player to my pathfinder game? I’m thinking about buying and wearing a D&D T shirt around – seems like it has been working for you! Work – Yeah, that’s the biggest one for me these days, recruiting coworkers. Maybe that’s because I’m in the video game industry, which is full of gamers. But I also worked for a security software company once which had a fair share of gamers as well. Culturally I think there’s a strong intersection between tech and gaming, but also as many have pointed out gaming has just become much more culturally acceptable these days than it ever was in the past. I guess I’d say if you’re comfortable hanging out with your coworkers outside of work, why not ask them if they’d be interested in a little D&D? Clubs – Do clubs exist outside academia? I have no idea, but certainly in college this is how I met most of my gaming friends. Heck, it’s how I met most of my friends period. If there’s a gaming club you can join, I’d say do it. If not, maybe you can form one? That sounds like a whole separate topic. Gaming Stores – When I first moved up to this area I wanted to start a game and so just went to the local game stores and pulled names off the bulletin boards. Do stores still do that? Maybe these days the store has a website instead. Anyway, my friend Adam and I cold-called maybe a half dozen or so people, of which I think we actually played with three and to this day I’d say one remains someone I consider a good friend. Coincidentally, that someone was the one woman we called. But if those old cork boards are a thing of the past, I’d say go to the local game store and just ask the person behind the counter. He or she can probably point you towards something. Conventions – Go and play games at conventions. Better yet, run games at conventions. I’ve met a lot of great gamers this way. And best of all, it’s a great way to vet potential players. Having played a convention game with them, you know what kind of gamer they are and have a pretty good idea if they’d be fun to have at the table regularly. One clever gamer I played with at a convention had business cards with her email on them, to hand to people she enjoyed playing with to stay in touch. You don’t have to be that formal about it, but definitely stop to get contact info from someone you had a good time at the table with rather than just getting up and disappearing into the crowd. The Internet – I know the least about this approach, but I’ve heard good things about meetup.com. I bet there are others. I’ve never personally used this so perhaps others can comment here. As for general recruitment advice, I’d say start small. Invite someone over for board games. Run a one-shot convention style game — they’re not just for conventions! It’s a great way to kind of get a feel for someone without immediately slamming them with a weekly obligation. 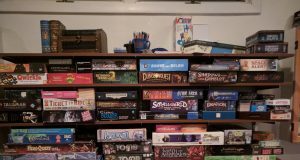 Play a couple one-off games, figure out who you like gaming with, then discuss plans for bringing them in to your regular game or starting up a new one. I guess that’s all I have. Who else has some advice for Scott? The Netflix series ‘Stranger Things’ has done a lot to generate interest among my students. Kids walk in the doors these days and ask where they can play D&D! I read a great line recently in the Blogosphere about how D&D isn’t something that exists inside a rulebook, it’s something that happens at a table. This seems to encapsulate the experience that this crowd is looking for. My advice for Scott is to strike up a conversation about who has seen Stranger Things.